This entry was posted in books, pneumatology, resource, Spirit baptism and tagged book review, books, pneumatology, resource, Spirit baptism. Bookmark the permalink. According to SGM they say that being filled with the Spirit and being indwelt by the Spirit are theologically distinct experiences. That would mean that one can be a genuine born again christian and not have ever experienced the filling of the Spirit. Although all christians are indwelt by the Spirit not all christians have experienced the filling of the Spirit. Would you agree with that? And do you believe that the filling of the Spirit is experiential in nature, meaning something that is felt or something that is tangible? I have been thinking about this for some time. By the way I love the idea of this blog. Good review Scott- know too that I Howard Marsahall has a book called Luke the Historian and Theologian so that idea has been around – glad Stronstad build on it. Yeah, I am aware and have read Marshall’s book. 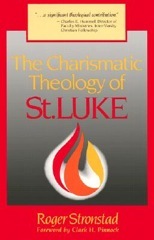 Great resource for understanding the theological importance of Luke (not just in pneumatology, but as a theologian in general).